This is a sketch of our daughter, sketched by our daughter. A self-portrait, if you will. Dahlia's got game, both on the soccer pitch, and when she's got a pencil in her hand. 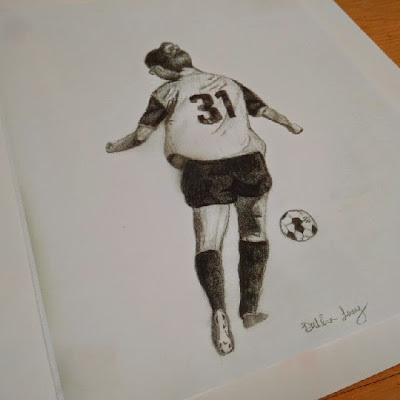 And I keep coming back to this particular work, because it reminds me of a moment in her young life when nothing else mattered but being out there on the field, giving her all. I can't take credit for any of it, as I'm still struggling with stick figures. But when she grabs her notebook and settles in for some quiet-creative time, it's only a matter of time before the walls of our house get another candidate for another piece of her home-grown art. Your turn: What should she draw next? And she takes great photos, too?! Lots of talent in that girl!